Careful acoustic design and the use of advanced materials contribute to the exceptional music fidelity and speech intelligibility exhibited by the RCF Monitor 44T (black) and Monitor 44/WT (white) two-way speaker systems. The carbon fiber diaphragm remains extremely rigid at high power levels, producing a more linear response and lower distortion. The cone is fitted with a durable foam surround and treated to resist moisture. The high-frequency section features a constant directivity horn with a built-in mechanical phase equalizer. The horn is driven by a Ferrofluid® cooled, 0.5" mylar dome tweeter. The system is nominally crossed over at 4 kHz by a 12 dB/octave network, which uses markedly lower (than conventional) inductance values in series with the woofer. This design reduces sound delays associated with high inductance values and provides excellent low fre-quency transient response. The high-pass section is corrected for optimum perfor-mance of the CD horn and is protected with a circuit based on a low-value/low-mass filament resistor that smoothly limits the power sent to the tweeter driver. All components are housed in a vented enclosure formed from semiexpanded polystyrene foam that is extremely strong, lightweight and weather resis-tant. Threaded metal sockets are molded into the cabinet to facilitate quick, safe deployment of the Monitor 44T, as a single unit or in arrays, using specially designed accessory mounting hardware. 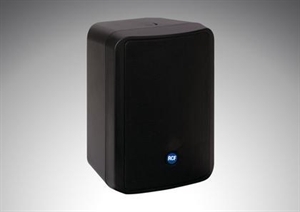 The Monitor 44T is a part of RCF’s Monitor Series, which includes two-way constant directivity, compact speakers in easily installed enclosures. 5" high-efficiency carbon fiber woofer CD horn loaded, 0.5" dome tweeter. - Built-in, multi-tap constant voltage transformer. - Built-in, low-inductance passive crossover with high-frequency dynamic protection. - Lightweight, UV/weather resistant, trapezoidal shaped enclosure for multiple applications and minimum visual intrusion. - Integrated mounting points for use with optional mounting hardware. - Articulated surface mount hardware included.